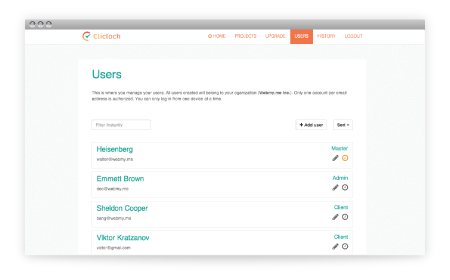 Cliclock - Track your time with a click. Simple. Track your time with a click. Simple. Clunky software can certainly get the job done... but why go through the hassle? 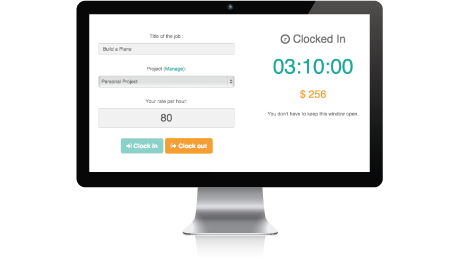 It doesn't get any simpler than Cliclock when you need a way to track time spent and cost on projects. Filter and export your logged data in the simplest way possible. Did we mention that Cliclock is simple? Simple doesn't have to mean featureless. 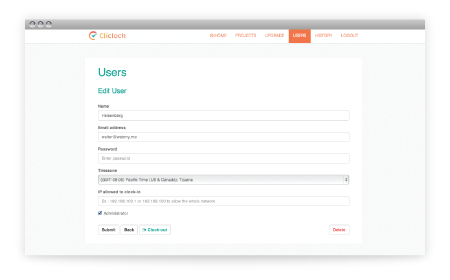 You will be able to: get a detailed history for each user, view employee logs or user modifications to clocking, place IP restrictions, share projects and have full use of the Xpress clock-in feature. Are you a restaurant or other small business owner? 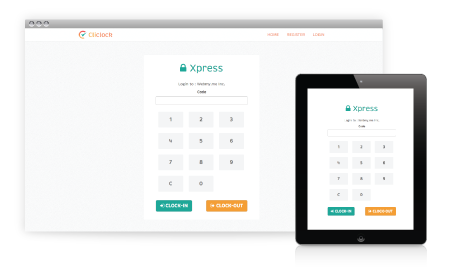 Place an iPad (or similar device) in a central location with the Xpress clock-in/clock-out page loaded and have your employees sign-in/out when they enter or leave the workplace by just typing a PIN code. It's that simple! Account Holder (Admin + can upgrade license), Admin (able to add/edit users and edit users' history) and Employee (able to clock in and out, create projects and edit his/her own history). Want to hold members of your team more accountable? You can enforce IP restrictions on clock-ins to make sure your employees are where they need to be. You can limit users to a specific IP or to a whole network. Use Quickbooks or similar accounting software? 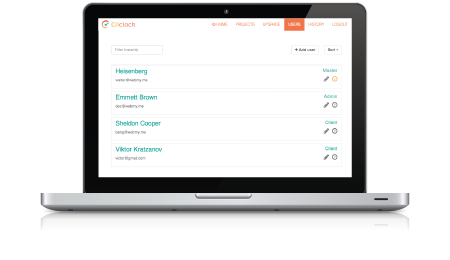 Select the dates, users and projects on Cliclock and export your data into a handy CSV file. It is very easy to integrate this data into your accounting software or database. All our plans come with daily backups, SSL encryption and email support. Even the free plan. To use any of the paid plans, register for free and then upgrade.